Thunderbird is a free, open source, cross-platform e-mail and developed by the Mozilla Foundation. 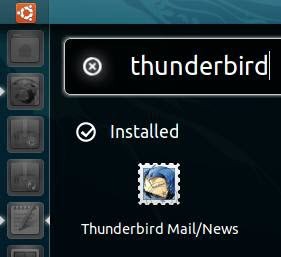 Thunderbird will be the default e-mail client in Ubuntu 11.10.
what’s new in this Thunderbird 6? click here. hit enter and type ubuntu password. 2.To open Thunderbird, click Applications icon from unity launcher. And type Thunderbird in the search applications field.And click Thunderbird mail/News. This looks good and easy, but it does not work! When I type in the first command, I get back command not found, so I’m stuck. For some reason Ubuntu loads only Thunderbird 3 and I want TB6. Any ideas? @Hugh – do as Admin says and it will work fine. Initially, I simply copied and pasted the commands from web page to Terminal – this did not work as it included some spurious strings. By TYPING the commands MANUALLY, everything worked fine.